Daschela’s Just Confused | That Was an Accident! Here’s the trick… the guys who want to go on to further parts of the dungeon are generally a) experienced and b) playing because they enjoy it. That paladink was likely just playing a tank to say “oh but i tank this and its easy” to the poor bastards in LFG, and doesn’t even know what active mitigation *means*. That said, certain dungeons are just harder. Have fun in Stratholme. I love to heal, but if you’re unlucky and end up with a tank who doesn’t know what s/he is doing healing can be a real pain in the behind. Same goes for when you get DPS who insist on standing in stuff and getting tons of dmg. Best way around “problem tanks” is to find your self friend who’s a good tank and likes to do instances with you. If I didn’t have my pocket tank I’d go crazy. Alas, though my one friend plays a Prot Warrior, he’s level 90 and Horde. I’ll just have to get used to bad tanks, or get lucky and make a random friend. While my other friend Fel likes to tank, his Alliance alt is a mage, and a magetank is not quite what Daschela’s looking for. She’s looking for somebody a bit … sturdier. Great story 🙂 Loved reading it. Don’t let the wannabee tanks get you down, although you need a very very thick skin to deal with it. I’ve been healing for what seems like forever, and I have a pretty good knowledge of all the dungeons (but don’t ask thing like my own phone number, I actually have to hurt my brain to come up with it), so I know when there is big healz necessary etc. 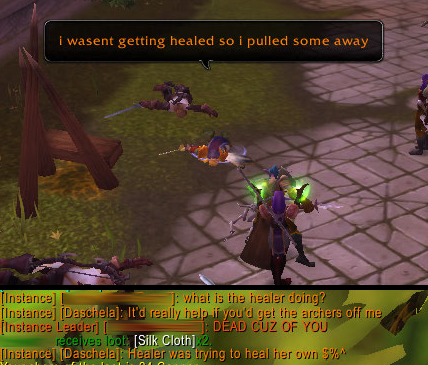 As a rule, and you really have to do this, is NOT feel responsible when a DPS dies. Heck, sometimes you don’t even have to feel responsible when the tanks dies. Most LFD tanks these days don’t even use tank cooldowns like Leit said. A healers job is not to heal people standing in da bad stuff, once okay, twice perhaps if I’m in a good mood. 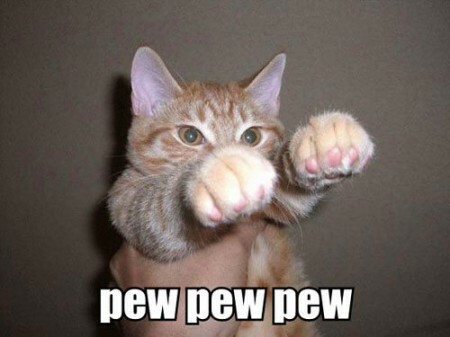 But three strikes and by god you better have some bandages in your bags. Scripted events like Scarlet Mon. are a great way to see if people have a clue or not. BUT MAKING PEOPLE LIVE IS MY JOB! Or something. 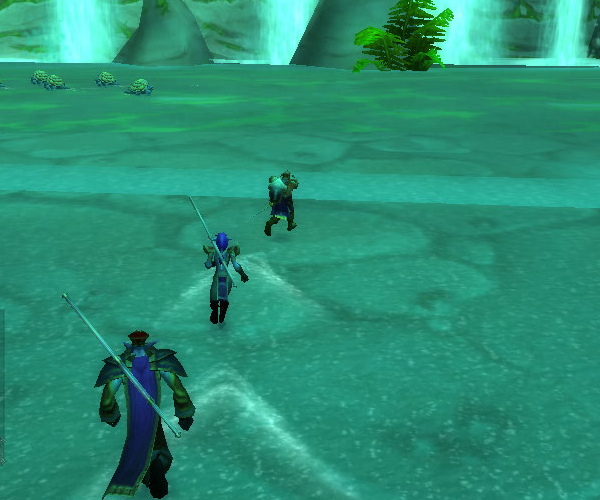 I don’t think the night elf rogue was standing in a lot of bad – maybe she was attacking the wrong mob, and Mr. Protank didn’t know or care to get aggro back? It just seemed like every time I turned around, she was dead on the floor somehow. And a little addendum on my last sentence … that is not intended to be a prima-donna jerk in the group. I had a pleasant convo the other day in a random LFD (I do it daily for the valor). The Rogue whispered me saying ‘Sorry if I die a lot but this is my first time here and I’m not really sure what to do and what not’. That was a pleasant surprise. So I healed that dude (dudette?) like a pro. He never died once. Granted he took a lot of avoidable damage, but it was nice to actually see someone take personal responsibility and whisper me in advance saying he was new and it was all very intimidating. Haven’t met a person like that yet, but with 50 some levels left to go before maxxing out, it’s only a matter of time. Pingback: Prima Tankin’ Donna | That Was an Accident!